I am incredibly grateful for all the opportunities coming into my life every day - and I am blessed with the clients that I get. People like Eva & Killian who are true wandering souls just like me, they love new places, they love discovering and living to their full potential . They are also incredibly kind, loving, comfortable in front of the camera and just happen to be stunningly beautiful. It was my first time in Morocco and it won't be my last one - the smells, the bustle and the craziness of Moroccan drivers seem like a distant memory now, but the whole trip was a true experience. So different from a typical holiday destination and yet so close to Europe. It is also special because it was my first destination elopement wedding outside UK or Ireland. 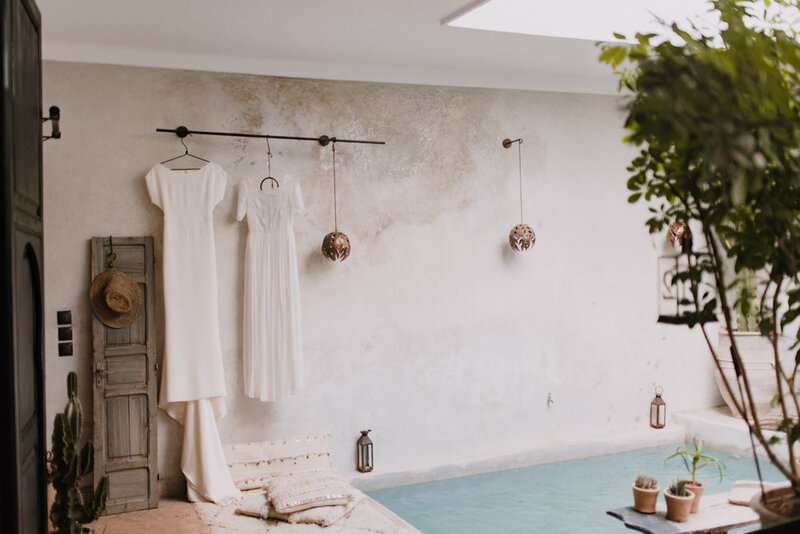 I have so much respect for anyone who's planning their own wedding, yet the one abroad, in a place so different and non-traditional like Morocco. We started the morning prep in Marrakech's most Instagrammed Riad - La Maison Marrakech. Eva had 2 dresses - day dress from Cherry Williams and evening dress from Luna Bride. Eva found Marian, a local MUA on Instagram and she also did her hair. It was crucial we got the make up right, as the temperatures on Agafay desert in October can still reach 30' and the last thing we'd want is a tired looking bride. Marian did a fantastic job and Eva looked happy & glowing in the Moroccan sun. Little can I say, that would come close to describing how infinite it feels on the desert. We drove to Agafay Desert, situated about 30 km away from busy Marrakesh to experience the most serene and beautifully picturesque view of Atlas mountains. 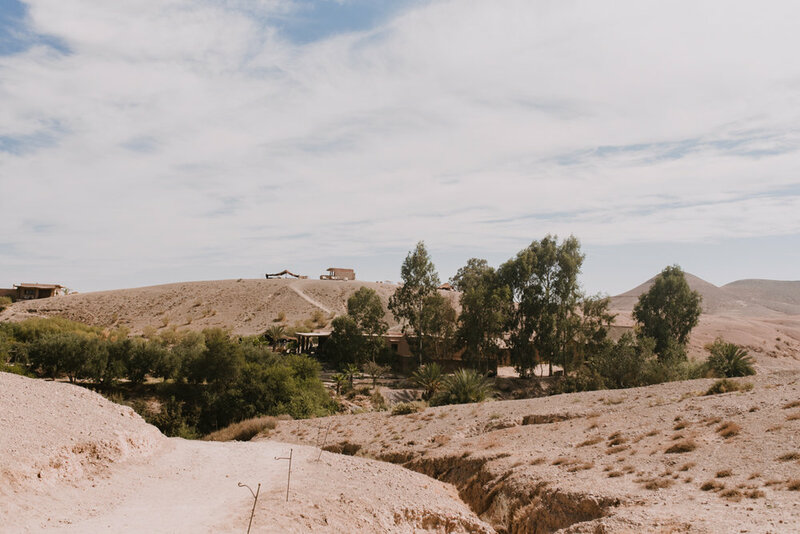 There are two very popular places to camp under the stars and consider your Moroccan wedding or elopement - Scarabeo Camp and La Pause, where we were heading. The venue on Agafay Desert is called La Pause, because it perfectly describes what you do when you get there. You take a break. There is no electricity, no wifi, just camels, great food and the mountains. And it doesn't feel lonely. I had an amazing time shooting this elopement wedding inspiration in Morocco & I' grateful for all new frendships we made there. If you'd like to see more images of my travel & food adventures while sightseeing Marrakech click here. Thanks to Eva & Killian, an amazing bride and groom! I hope I'll be able to work with you again one day & thank you for everything. Special thanks to Anneka, Radka, Marta & Nicola Dixon for organising. Hit the play button & enjoy images of Agafay Desert Elopement in Morroco.